Along with our 30 Acts of Goodness (Summer 2018) we will continue to bring together our communities through working in partnerships with a few select charities. Through the Good Food Builder* group, we commit to donate a specific amount of profit each year to the Community Food Centres Canada. An organization near and dear to our hearts, is helping people across this country develop integral skills through food access, education and community. *If you are a food producer, consultant, distributor or industry partner, who would like to participate in the Good Food Builder program,please send us an e-mail! 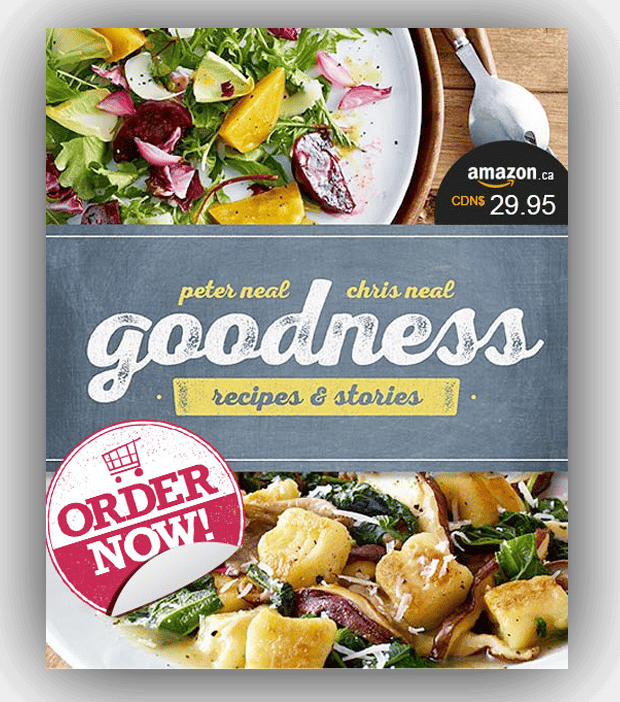 Goodness: Recipes Stories celebrates 37 good food fighters from across Canada—chefs, entrepreneurs, growers, and food activists who believe that good, healthy food should be accessible to all. Each of their stories underlines the simple truth: food has the power to enrich lives and build strong communities. From supporting sustainability to championing access, outreach, and education, these individuals serve up tablespoonfuls of goodness every day—and in this cookbook they serve up some of their favorite recipes, too. Well-known chefs such as Lora Kirk, Brad Long, Jamie Kennedy, and Vikram Vij, entrepreneurs such as Elana Rosenfeld from Kicking Horse Coffee and Mike Fata from Manitoba Hemp Harvest, food activists such as Nick Saul, Lil MacPherson, and Sarah Harmer, community food centre champions such as Kim Fox and Paul Taylor, and growers such as Gillian Flies of The New Farm and Michael Abelman of Fields of Plenty explain why good food matters and what community means to them as well as share personal recipes that are perfect for enjoying with family and friends. Highlights include Salmon Rillettes; Quinoa Chicken Salad; Wild Leek &amp; Morel Quiche; Dungeness Crab Tacos; Spicy Pork Noodles; Perogies with Caramelized Onion, Braised Beef Shank &amp; Celery; Caramel Apple Butter Rugelach; and Ginger Stout Cake with Orange Meringue &amp; Coffee Caramel, just to name a delicious few!